Join Ariel, Sebastian, Flounder and Scuttle in their world under the sea with this children's locket inspired by the classic Disney animated film, The Little Mermaid. This rhodium plated silver locket is designed in the shape of a shell, with a swimming Ariel visible on the front. Inside the locket is room for small images and keepsakes and is set on a silver chain with an adjustable clasp. This children's locket necklace comes in a sweet Disney presentation box, the perfect present for your little ones. 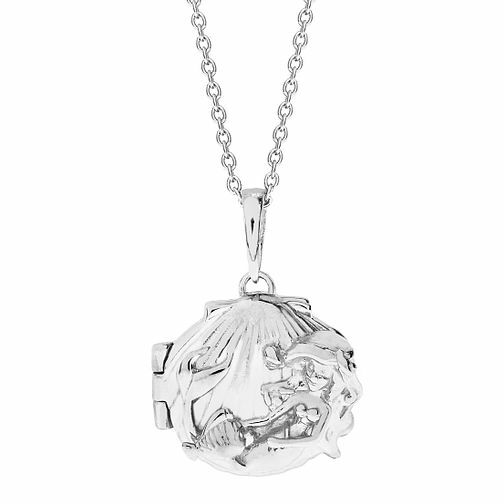 Disney Little Mermaid Children's Silver Shell Locket is rated 2.5 out of 5 by 2. Rated 4 out of 5 by Anonymous from Good for the price This charm was exactly as expected, however it doesn't hold it's shape very well causing the locket to open. Rated 1 out of 5 by Anonymous from Chain broke taking it out of the box This was bought as a special gift for my daughter on her 5th Birthday. She was left extremely disappointed as the chain broke as I was removing it from the box. She never got to wear it and was totally heart broken. I was left devastated for her as she is a little girl who is so loving and kind and truely believes in the magic of fairies, princesses and mermaids. I believed a suitable solution would be to have the chain replaced with a sturdier chain but the store wanted to charge us extra for which I thought was unjustified. Sadly we returned the chain and locket and opted for a refund. Still leaves me with a special little girl without a special birthday mermaid locket.